StaticDeploy is an open-source platform for deploying and configuring static web applications and websites. We can think about it as a Kubernetes for static content. Before finding out how StaticDeploy reaches these goals, let&apos;s get an idea of the entities StaticDeploy deals with. Bundles are tar.gz archives of static content (assets), plus associated metadata describing the archives (a name, a tag, a description, etc.). Conceptually bundles are equivalent to docker images. Bundles must specify a fallback asset, an asset that will be served to requests that don&apos;t match any other asset. 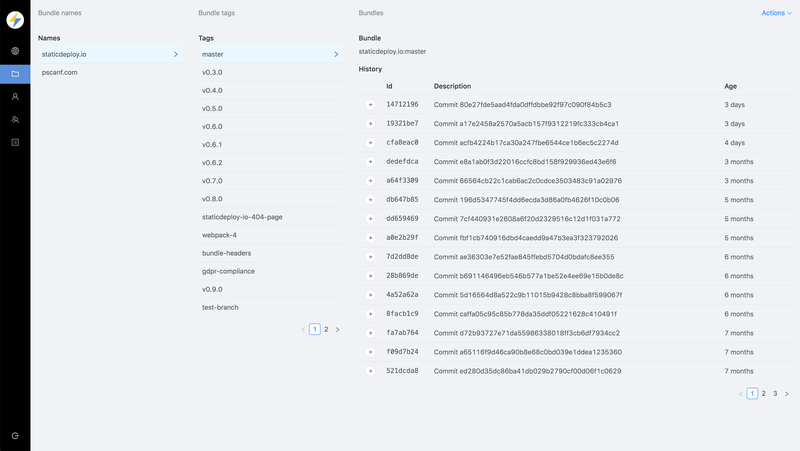 Bundles can be created with the bundle command of the StaticDeploy cli, by giving it a folder that gets archived into a tar.gz and uploaded to the StaticDeploy backend. Entrypoints may specify a configuration, a (string, string) dictionary that is injected at serve-time into the html files of the bundle. Entrypoints can be created manually from StaticDeploy&apos;s admin console, or automatically when deploying a bundle with the deploy command of the StaticDeploy cli. Apps are groups of entrypoints. Apps define a default configuration to be used for entrypoints which don&apos;t define one. 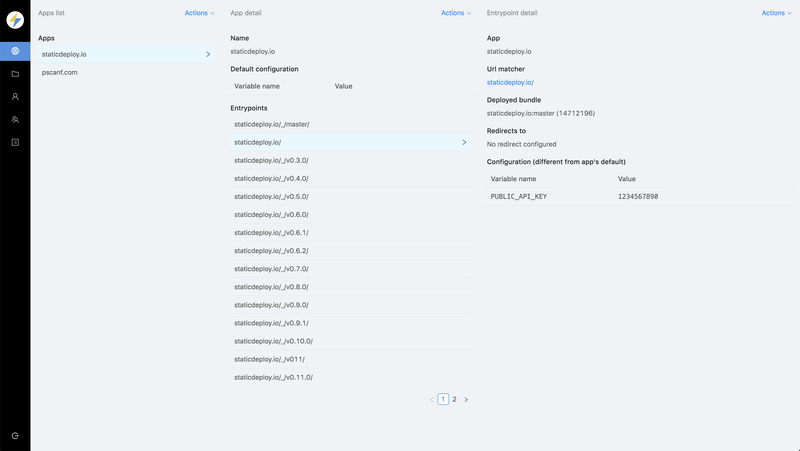 Apps can be created manually from StaticDeploy&apos;s admin console, or automatically when deploying a bundle with the deploy command of the StaticDeploy cli. The configuration page of the documentation goes in more details about how configuration works. Bundles and entrypoints are very "cheap" objects in StaticDeploy: we can have thousands of them without incurring into significant degradations of performance. This means we can create bundles for every commit of every app we deploy on StaticDeploy. And we could deploy each bundle to a unique entrypoint, though we might prefer to take different approaches, like having one entrypoint for each branch of each app. --description "Build of commit $COMMIT"
But we could choose different url schemes for the app&apos;s entrypoints, like prefix-$BRANCH.example-app.com/ or example-app.com/$BRANCH/. The workflow page of the documentation explores different workflows for deploying static apps.